artfully recombines recurring elements: the rhythms of travel; the pleasures of music, strong drink and vengeance; touchy encounters with pedants, mountebanks, violently opinionated aesthetes and zealots, louts, bigots of all stripes and boyishly slim young women with an enigmatic habit of looking back over their shoulders. His stories sustain an anecdotal forward drive that balances his digressive pleasure in imagining a world and the hypnotic effect of his distinctive tone, which has been variously described as barbed, velvety, arch and mandarin... Reading Vance leaves you with a sense of formality, of having been present at an occasion when, for all the jokiness and the fun of made-up words, the serious business of literary entertainment was transacted. 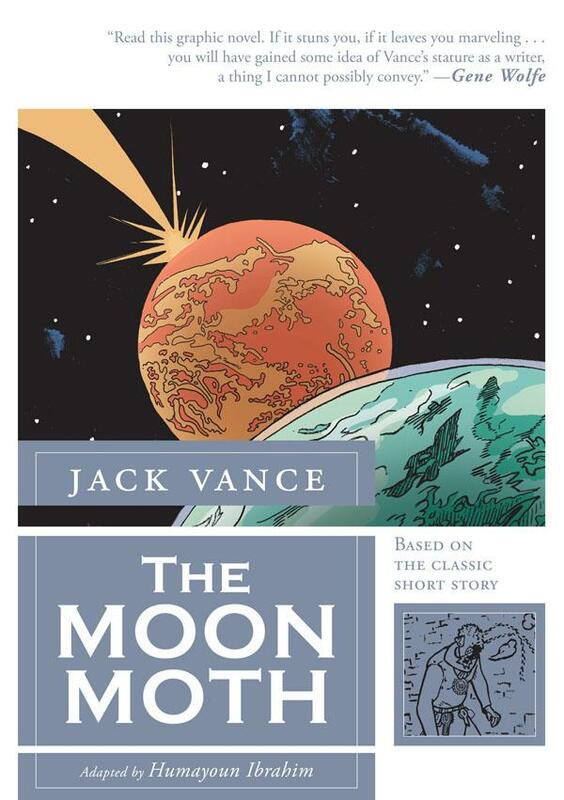 This recitation perfectly sums up what goes on in The Moon Moth. This is a complex tale of identity, social customs, and communication wrapped up in a murder mystery using the cover of “high-concept science fiction”. If you have never read the story, it is brilliant – literary and accessible, engaging and thought-provoking. Ibrahim's adaptation stays blessedly true to all these aspects of the story. 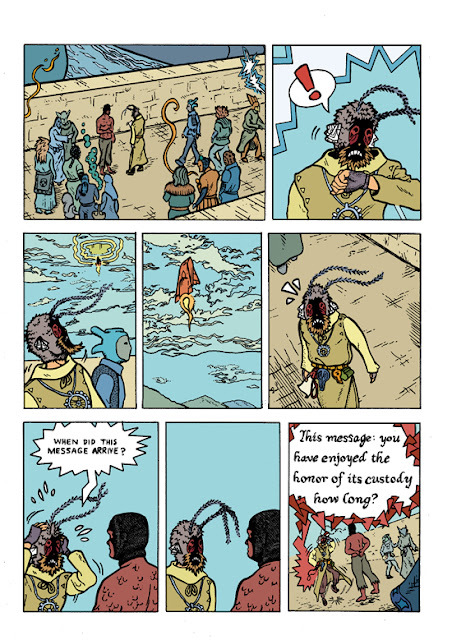 By presenting it as a graphic novel, though, Ibrahim adds another layer of complexity to the tale. In a visual medium, much of Vance's descriptive passages are rendered redundant, as the art is used to convey the scenes and personalities. Ibrahim does a wonderful job of this, especially given the fact that this is his first graphic novel. His clean lines, evocative color palette, and inventive styling all add to the rhythm of Vance's story and enhance the pacing of the tale. There are a few times where the choices Ibrahim makes in terms of panel layout are a little odd, but the overall effect of his art is spot on and reinforces Vance's themes. 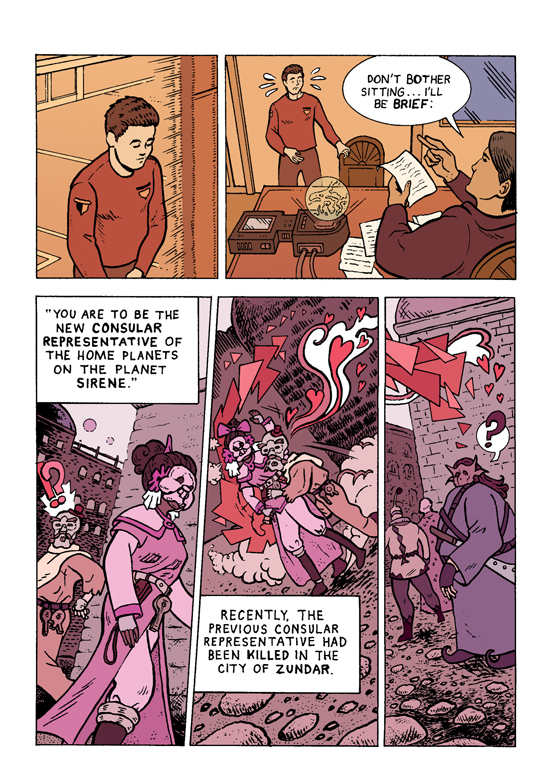 This is a wonderful story which is certainly augmented by its presentation as a graphic novel. Hopefully its publication will lead to a wider audience for Vance's writing, as well as pave the way for further adaptations of his work, both as graphic novels and even film. To check out a preview from First Second, click here.